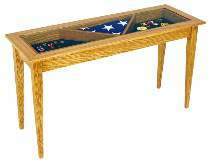 Display table is designed to hold a military size memorial flag and still provide space for medals of recognition, emblems, photos, etc. This table can also be made without the flag partitions and used to display many different collections. All patterns drawn FULL SIZE including a taper jig to cut the legs. The display compartment is 3-1/4"D. Table measures 30"H x 54"L x 18-3/4"W.